Recently I had the opportunity of mixing two of my hobbies by putting on a small public display at the Napoleonic reenactment event at Ickworth House, Suffolk. 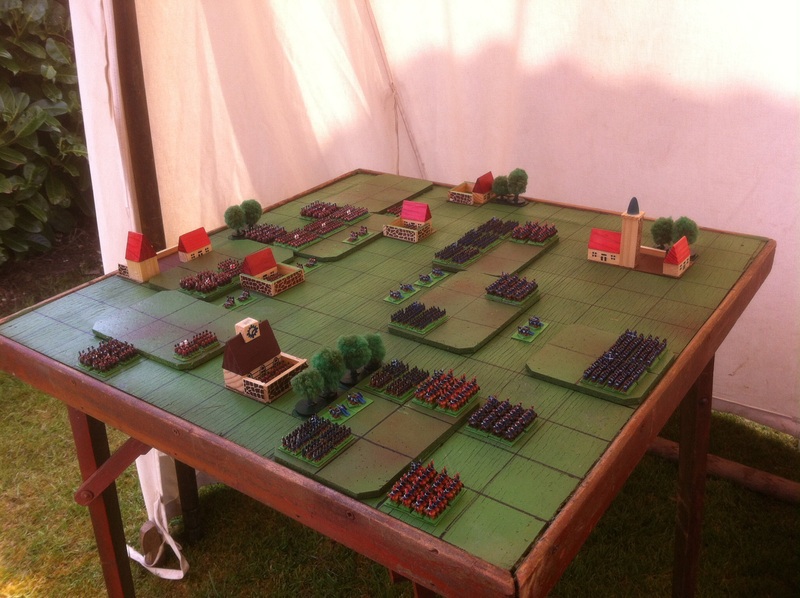 In my role as an old soldier I have designed a game to relive my past glories on the tabletop. This has gone through various design steps and the latest version is played on a squared grid, using 6mm model soldiers. As a change from my usual practice of displaying a battle from 220 years previously (20 years in my timeline) I tried to recreate Waterloo in a highly condensed form, in keeping with the event theme. Red Army and Blue Army deployed for the start of the Waterloo game. The armies are generic, Red and Blue, and there are five troop types, identical for both sides. These are Artillery, Line Infantry, Guard Infantry, Light Cavalry and Heavy Cavalry. For the Waterloo game the ground scale was 400 metres to a square and the figure scale 1:100 (guns at 1:25). A square could contain 7200 infantry, 3200 cavalry or 50 guns. During the course of the display I tweaked the rules and made notes as awkward situations arose. The rules seem to be generally working, but have now expanded beyond the original single sheet. I want to keep them simple enough to allow a passer-by to sit and play a turn or two. The problems were in the scenario and the condensing of a three-mile front into 12 squares. Hougoumont became almost inaccessible to the French because of the woods. La Haie Sainte fell too quickly and Grouchy twice managed to arrive despite a 1:216 chance of doing so. The battle for Plancenoit, on the other hand, played out most satisfactorily. The results? With the victory conditions set as ocupation of both villages (Mont St. Jean and Plancenoit) and two of the four farms (Hougoumont, la Haie Sainte, Papelotte and Frischermont), Blue Army won the first day and the second day was a draw with both sides exhausted. At least they did better than the reenactment French! I really like the ‘vintage campaigning board’ effect your table has! Very nice work sir!